Disruptive coloration (also known as disruptive camouflage or disruptive patterning) is a form of camouflage that works by breaking up the outlines of an animal, soldier or military vehicle with a strongly contrasting pattern. It is often combined with other methods of crypsis including background colour matching and countershading. It appears paradoxical as a way of not being seen, since disruption of outlines depends on high contrast, so the patches of colour are themselves conspicuous. The importance of high-contrast patterns for successful disruption was predicted in general terms by the artist Abbott Thayer in 1909 and explicitly by the zoologist Hugh Cott in 1940. Later experimental research has started to confirm these predictions. Disruptive patterns work best when all their components match the background. While background matching works best for a single background, disruptive coloration is a more effective strategy when an animal or a military vehicle may have a variety of backgrounds. Conversely, poisonous or distasteful animals that advertise their presence with warning coloration (aposematism) use patterns that emphasize rather than disrupt their outlines. For example, skunks, salamanders and monarch butterflies all have high-contrast patterns that display their outlines. The principle of "maximum disruptive contrast" by Hugh Cott, 1940, "showing the distractive effect upon the eye of patterns which contrast as violently as possible with the tone of their background"
Markings... of whatever sort, tend to obliterate,—to cancel, by their separate and conflicting pattern, the visibility of the details and boundaries of form.... If the bird's or butterfly's costume consists of sharply contrasted bold patterns of light and dark, in about equal proportions, its contour will be "broken up" against both light and dark—light failing to show against light, dark against dark. Such is apparently the basal and predominant use of almost all the bolder patterns in animals' costumes. The function of a disruptive pattern is to prevent, or to delay as long as possible, the first recognition of an object by sight... irregular patches of contrasted colours and tones ... tend to catch the eye of the observer and to draw his attention away from the shape which bears them. Various recent attempts to camouflage tanks, armoured cars and the roofs of buildings with paint reveal an almost complete failure by those responsible to grasp the essential factor in the disguise of surface continuity and of contour. Such work must be carried out with courage and confidence, for at close range objects properly treated will appear glaringly conspicuous. But they are not painted for deception at close range, but at ranges at which ... bombing raids are likely... And at these distances differences of tint ... blend and thus nullify the effect and render the work practically useless. The pioneering work of Thayer and Cott is endorsed in the 2006 review of disruptive coloration by Martin Stevens and colleagues, which notes that they proposed a "different form of camouflage" from the traditional "strategy of background matching" proposed by authors such as Alfred Russel Wallace (Darwinism, 1889), Edward Bagnall Poulton (The Colours of Animals, 1890) and Frank Evers Beddard (Animal Coloration, 1895); Stevens observes that background matching on its own would always fail because of "discontinuities between the boundary of the animal and the background". Disruptive patterns use strongly contrasting markings such as spots or stripes to break up the outlines of an animal or military vehicle. 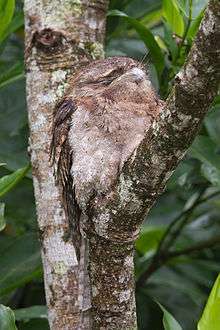 Some predators, like the leopard, and some potential prey like the Egyptian nightjar, use disruptive patterns. 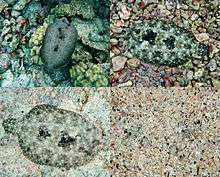 Disruptive patterns are defined by A. Barbosa and colleagues as "characterized by high-contrast light and dark patches, in a nonrepetitive configuration, that also provide camouflage by disrupting the recognizable shape or orientation of the animal", as in the cuttlefish. The strategy appears paradoxical and counter-intuitive as a method of camouflage, since disrupting outlines depends on using patches of colour which contrast strongly with each other, so the patches are themselves conspicuous. While background matching works best for a single background, disruptive coloration is a more effective strategy when an animal or a military vehicle may have a variety of backgrounds. Martin Stevens and colleagues in 2006 made what they believed was the first experimental test that "disruptive coloration is effective even when some colour patches do not match the background and have a high contrast with both the background and adjacent pattern elements (disruptive contrast)". They used "moth-like targets", some matching the lightness of the background oak tree bark, other mismatching it, each with a dead mealworm. If the mealworm was removed it was assumed a bird predator had taken it: this could be distinguished from visits by other predators. They found that disruptive coloration provided the best protection from bird predators when the pattern was matched to background luminance, but even when elements in a pattern did not match, disruptive patterns were still better at reducing predation than either non-disruptive patterns or plain (unpatterned) control targets. Disruptive patterns can also conceal specific features. Animals such as fish, birds, frogs and snakes can readily be detected by their eyes, which are necessarily round and dark. Many species conceal the eye with a stripe that runs through the eye, sometimes contrasting with a stripe above the eye, making it seem just part of a dark area of background. Cott called this a "coincident disruptive pattern". Many poisonous or distasteful animals that advertise their presence with warning coloration (aposematism) use patterns that emphasize rather than disrupt their outlines. 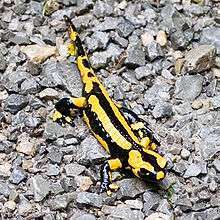 For example, skunks, salamanders and monarch butterflies all have high contrast patterns that display their outlines. These advertising patterns exploit the opposite principle to disruptive coloration, for what is in effect the exactly opposite effect: to make the animal as conspicuous as possible. The outlines of an animal's body can be made hard to see by other methods, such as by using a highly irregular outline. For example, the Comma butterfly, Polygonia c-album, is highly cryptic when its wings are closed, with cryptic colours, disruptive pattern, and irregular outer margins to the wings. Disruptive coloration is common in military usage, for military vehicles, for firing positions and other installations, and for individual soldiers, where uniforms, equipment such as helmets, and face paint may be used to break up outlines and features. 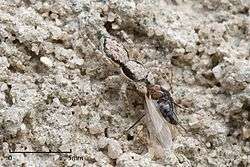 Disruptive coloration, however, does not always achieve crypsis on its own, as an animal or a military target may be given away by other factors including shape, shine, and shadow. 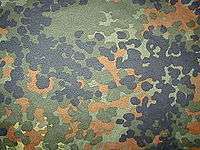 Many military camouflage patterns since the 1940s have been disruptively coloured, and with the issue of US Woodland pattern to United States armed forces from 1981, disruptive pattern became a dominant feature of military uniforms. From 1969, Disruptive Pattern Material (DPM) began to replace plain material for uniforms in the British Armed Forces and was later used by many other armies. Three major challenges face the design of disruptively patterned uniforms, however. Firstly, units frequently move from one terrain to another, where the background colours and contrasts may differ greatly. A uniform designed for woodland will be too strongly contrasting for desert use, and too green for urban use. Therefore, no single camouflage pattern is effective in all terrains. The American UCP of 2004 attempted to suit all environments but was withdrawn after a few years of service. Terrain specific patterns like "Berlin camouflage", which was applied to British vehicles operating in Berlin during the Cold War, have sometimes been developed but are ineffective in other terrains. Secondly, the effectiveness of any pattern in disrupting a soldier's outlines varies with lighting, depending on the weather and the height of the sun in the sky. And thirdly, any given patch of printed colour varies in apparent size with distance from the enemy observing the pattern. A pattern printed with small patches of colour blends into a single perceived mass at a certain range, defeating the disruptive effect. Conversely, a pattern printed with large patches of colour appears conspicuous at shorter ranges. This problem has been solved with pixellated shapes, often designed digitally, that provide a fractal-like range of patch sizes, enabling them to be effectively disruptive both at close range and at a distance. The first genuinely digital camouflage pattern was the Canadian CADPAT, soon followed by the American MARPAT. A pixellated appearance is not essential for this effect, though it is simpler to design and to print. 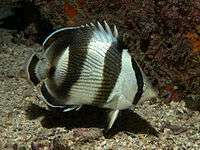 The banded butterflyfish, Chaetodon striatus has strong disruptive bands through the body and concealing the eye. ^ Stirling, Robert (2012). SAS Ultimate Guide to Combat. Osprey Publishing. p. 181. ISBN 978-1-78096-399-0. ↑ Cott, 1940. p. 53. 1 2 Thayer, 1909. pp. 77–78, and throughout. 1 2 3 Cott, 1940. pp. 47–67. 1 2 3 4 5 Stevens, M.; Cuthill, I.C. ; Windsor, A.M.M. ; Walker, H.J. (7 October 2006). "Disruptive contrast in animal camouflage". Proceedings of the Royal Society B. 273 (1600): 2433–2436. doi:10.1098/rspb.2006.3614. PMC 1634902 . PMID 16959632. ↑ Barbosa, A; Mäthger, L. M.; Buresch, K. C.; Kelly, J; Chubb, C; Chiao, C. C.; Hanlon, R. T. (2008). "Cuttlefish camouflage: The effects of substrate contrast and size in evoking uniform, mottle or disruptive body patterns". Vision Research. 48 (10): 1242–1253. doi:10.1016/j.visres.2008.02.011. PMID 18395241. 1 2 Endler, J. A. (October 2006). "Disruptive and cryptic coloration". Proceedings of the Royal Society B. 273 (1600): 2426–2426. doi:10.1098/rspb.2006.3650. PMC 1634903 . PMID 16959630. ↑ Cott, 1940. pp. 68-93. ↑ Cott, 1940. pp. 96, 193–199. 1 2 3 4 Mitchell, G; Skinner, JD (2003). "On the origin, evolution and phylogeny of giraffes Giraffa camelopardalis" (PDF). Transactions of the Royal Society of South Africa. 58 (1): 51–73. doi:10.1080/00359190309519935. ↑ Cott, 1940. p. 96. ↑ Department of the Army (30 August 1999). Field Manual Headquarters No. 20-3. 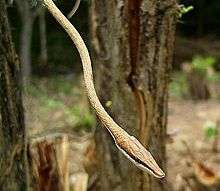 Camouflage, Concealment, and Decoys. ↑ Sweet, KM (2006). Transportation and Cargo Security: Threats and Solutions. Prentice Hall. p. 219. ↑ U. S. War Department (1944). FM 5-20, CAMOUFLAGE. ↑ Christine O. Hardyman, ed. (1988). "Chapter 7: Support Services". Department of the Army Historical Summary FY 1981. United States Army Center of Military History. ↑ "Trousers, Camouflage DPM Combat Dress 1968 pattern". Imperial War Museum. Retrieved 31 October 2015. ↑ US Army. FM 21-76 US ARMY SURVIVAL MANUAL. U.S. Department of the Army. Retrieved 8 January 2013. ↑ US Army (2009). Photosimulation Camouflage Detection Test. Natick, MA: U.S. Army Natick Soldier Research, Development and Engineering Center. p. 27. Retrieved 5 October 2012. ↑ Brayley, Martin J. (2009). Camouflage uniforms : international combat dress 1940–2010. Ramsbury: Crowood. ISBN 1-84797-137-7. ↑ Freedberg Jr., S.J. (25 June 2012). "Army Drops Universal Camouflage After Spending Billions". Aol Defence. Retrieved 27 September 2012. ↑ Craemer, Guy. "Dual Texture - U.S. Army digital camouflage". United Dynamics Corp. Retrieved 27 September 2012. ↑ Gye, H. (25 June 2012). "How U.S. Army spent $5BILLION on 'failed' pixel camouflage ... because they 'wanted to look cooler than Marines'". Mail (online). Retrieved 21 November 2012. Cott, Hugh B. (1940). Adaptive Coloration in Animals. Methuen, London. Thayer, Abbott H.; Thayer, Gerald H. (1909). Concealing-Coloration in the Animal Kingdom. Macmillan, New York.